It is a well known fact that tobacco usage is strongly associated with several lethal diseases as well as numerous chronic disabilities. Various studies have confirmed its perils and there is no doubt that a lot of awareness has been created regarding its hazards. However, it has not yet been effective in eliminating tobacco use. In one of its initiatives, several places have banned smoking in public areas. Sadly, this ban has not been able to deter people, who have now developed addiction to smokeless tobacco. The predominant forms of smokeless tobacco in India are Gutka, Pan Masala, and other such products that are posing serious health problems in India. While Pan Masala is an Areca Nut (Supari) product, Gutka is a combination of the smokeless tobacco and Areca nut (Supari). Both Pan Masala and Gutka contain several other additives such as menthol, perfume, spices, sugar, preservatives etc. to package it into a mouth freshening product. Analysis of various market preparations of Gutka and Pan masala in India have shown the presence of very high levels of heavy metals such as lead, cadmium, chromium, arsenic, copper, and nickel. These heavy metals are capable of causing serious diseases, as they are toxic even in minute quantities. The FDA has raided and seized several gutka products in the past, especially in Maharashtra and Gujarat due to the presence of very high levels of magnesium carbonate. An article submitted in the journal of Clinical Pharmacology and Therapeutics has studied the extent and time course of absorption of nicotine and the cardiovascular effects of smokeless tobacco (oral snuff and chewing tobacco), and compared it with smoking cigarettes and chewing nicotine gum in 10 healthy volunteers. The maximum levels of nicotine were similar but, because of prolonged absorption, overall nicotine exposure was twice as large after single exposures to smokeless tobacco compared with cigarette smoking. This will serve as an answer to those people who were under the notion that smokeless tobacco is less harmful than cigarettes. Another study published in the Lancet Oncology Journal in 2008, has established that apart from the risk of oral cancer, consuming smokeless tobacco may increase the chances of oesophageal and pancreatic cancer. It has also confirmed the shocking truth that in India and Sudan, more than 50% of oral cancers are attributable to smokeless tobacco products used in those countries. Strongly associated with pre-cancerous lesions and cancer of mouth that is a leading type of cancer in India. It is associated with hypertension and ischemic heart disease. Its use is associated with the increased risk of stroke. It adversely affects reproductive health in women and also seriously affects the fetus. Supari (Areca Nut, AN) has been declared as a cancer-causing substance by the International Agency for Research on Cancer, World Health Organization. Supari is one of the main ingredients in Gutka and Pan Masala that are posing to be serious problems in the country. A research “Role of areca nut in betel quid-associated chemical carcinogenesis: current awareness and future perspectives” in the Oral Oncology Publication revealed that the polyphenol fraction of an extract induces salivary-gland tumors and liver hemangiomas. The Drug and Alcohol dependence publication, 2008 has suggested that chewing areca nut during pregnancy was found to be significantly associated with both low birth weight (-89.54 g) and birth length reduction (−0.43 cm). 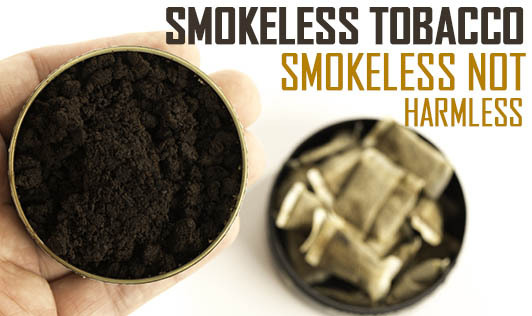 Smokeless tobacco is highly addictive and anyone who has ever had to deal with the after-effects can vouch that the enjoyment is not worth the suffering. It will not be an easy journey for those who quit. People who choose to give up tobacco would need extensive support from family and friends, and certainly a lot of willpower. What works best is focus and determination.